(AP) WASHINGTON - The U.S. job market is flagging, and consumer prices are barely rising. The picture sketched by data released Thursday has made some economists predict the Federal Reserve will announce some new step next week to boost the economy. The Fed's policymaking committee meets on June 19-20. Rising expectations that it will take some action sent stocks surging Thursday. The Dow Jones industrial average jumped 90 points in afternoon trading. 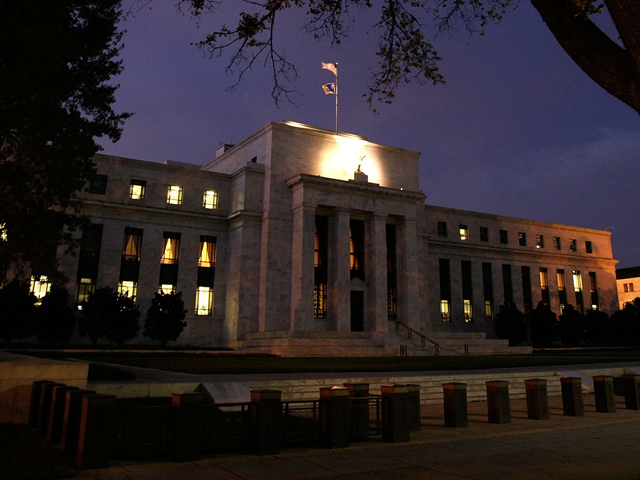 Fed officials are "likely to go into that meeting feeling a little chastened and looking for a way to support the economy," said Jeremy Lawson, an economist at BNP Paribas. Diane Swonk, chief economist at Mesirow Financial, said allowing the program to end could result in tighter credit and make it harder for Americans to buy or refinance homes. The reason: A key part of the program is buying new mortgage-backed securities with the proceeds from those that mature. Without those purchases, banks might issue fewer mortgages. Earlier this year it seemed less likely that the Fed would extend Operation Twist. Employers created an average of 252,000 a month from December through February. Consumers were growing confident in the economy and spending at the fastest pace in more than a year. The Fed forecast at its April meeting that the economy would grow by about 2.7 percent this year. But many economists are now predicting slower growth after seeing the economy slump this spring. Employers added an average of only 96,000 jobs per month in past three months. Consumers barely increased their spending at retail businesses in May. And European leaders are struggling to contain their financial crisis, which has already plunged much of the region into recession. "You look at all this and say, where's the growth going to come from?" Lawson said. Applications are a measure of layoffs. When they drop below 375,000, it typically suggests hiring is strong enough to reduce the unemployment rate. But applications have settled near or above that level since April. Many economists on Thursday said they don't expect job growth in June to be much better than April or May. Swonk said that the Fed might take further action later this summer, particularly if Europe's economy worsens. A deep recession in Europe could weigh on the U.S. stock market and cut into U.S. exports, slowing American growth. The consumer price index dropped 0.3 percent in May, the Labor Department said in a separate report. The biggest, which was the decline since December 2008, was mostly because of a 6.8 percent drop in gas prices. Food costs were unchanged. Over the past 12 months ending in May, consumer prices rose 1.7 percent, much less than April's pace. It's also below the Fed's target of a 2 percent annual gain. Average national gas prices have tumbled 41 cents after peaking April 6. The average price per gallon on Thursday was $3.53, according to AAA. Economists expect prices to fall even further in coming months, as gas prices continue to drop. So-called "core" prices, which exclude food and energy, rose 0.2 percent for the third straight month. They have risen 2.3 percent in the past year. Rental costs pushed up core prices. Rents are rising as more people forgo homeownership and rent instead. Prices for used cars and trucks, medical care, airfare and clothing also rose. But some economists said that most of those trends could be temporary and core prices may dip in the coming months.